It’s one thing when a kindergartner gets stumped on their kindergarten-level homework. But what happens when the kindergarten-level homework is tricky enough to stump the parents? 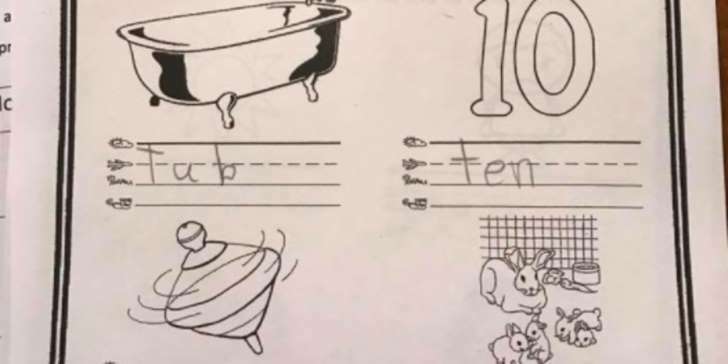 This happened to one New York mom and daughter duo, and soon enough, this kindergartener’s homework actually baffled the entire internet. Royce Winnick posted a picture of her daughter’s homework sheet to her Facebook in search of answers. The page is clearly designed to have kids practice writing their T’s and spelling T-named objects. Tub, ten, top, and then — what the heck does that group of rabbits have to do with T? Winnick was at a loss and asked her Facebook friends to help her out. 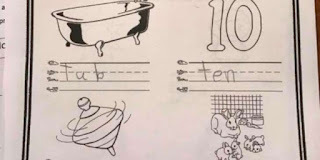 Winnick’s daughter thought the answer was simply “rabbit,” but together she and her mom decided to write in “pet.” The teacher marked the answer, “OK,” but we don’t think the question was OK to begin with! “The real answer was ‘vet’ which makes no sense!” Winnick told the Huffington Post. Ahem, excuse me? Vet? And what’s more infuriating is that on “K” worksheet, the kindergarteners were meant to label a drawing of man “Ken,” and picture of a family, “kin.” How the heck is anyone supposed to know that guy is named Ken?! We guess kindergarten just isn’t what it used to be! Gone are the days of reading a page of Dogzilla for homework and calling it a day! We wish the kindergarteners of the world the best of luck on their future assignments. If you need help, we’re just a tweet away.